The 27-story Bosco Verticale is planted with more than 2,000 plants and 900 trees—ranging from 10 to 30 feet tall—supported by steel-reinforced concrete balconies. The towers feature 27 residences, including a 22nd-floor perch designed by Matteo Nunziati. Nearly every piece in the apartment has a pedigree. An AJ table lamp by Arne Jacobsen sits on a Domino table by Nicola Gallizia beside a Night&Day bed by Patricia Urquiola for Molteni&C. The Butterfly stool is a 1954 design by Sori Yanagi. Soothing hues ranging from white to gray pair with warm woods throughout the residence. The dining area feature Who chairs by Rodolfo Dordoni for Molteni&C. The kitchen—a customized version of the Dada Tivalì system, designed by Dante Bonuccelli, with a Hi-Line6 hood and island—was imaged as a white monolith that can be hidden behind doors tucked within the framework. The sitting area features Jean Nouvel's Graduate shelf for Molteni&C and walnut stool by Charles and Ray Eames. In a once-gritty quarter of Milan, 900 trees grow high above the city, perched upon a pair of towers 26 stories tall. This urban woodland is known as Bosco Vertical (Vertical Forest), and it's a game-changing design by Studio Boeri that packs more than 75,000 square feet of dust-filtering, CO2-cleaning, noise-mitigating biodiversity into the urban center. 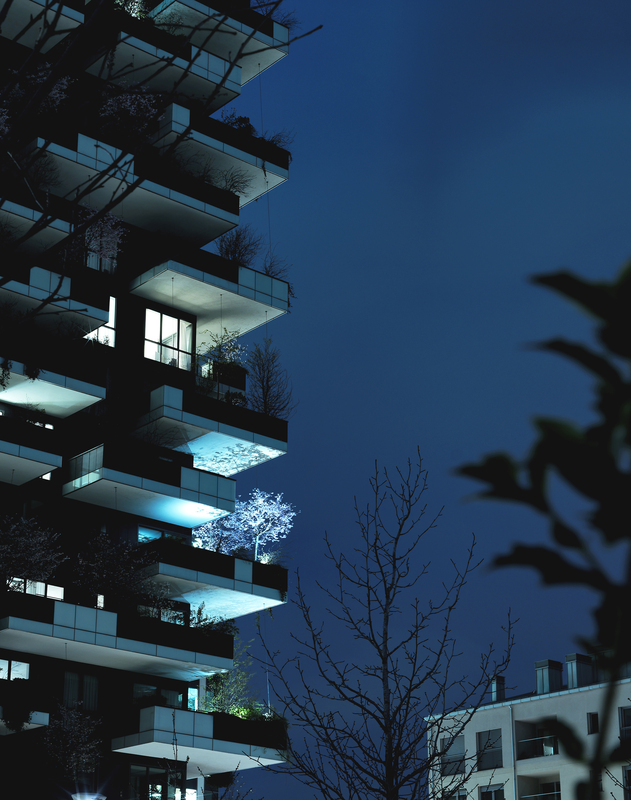 While its living facade certainly makes a statement, a new interior design by Matteo Nunziati shows its not just the sustainability of these eco-friendly towers that makes us green with envy.